Newton Kismet 3 Reviewed - To Buy or Not in Apr 2019? Newton is known for their innovative, lightweight running shoes. Having started this small “outsider” company just a decade ago, Newton’s reputation has been bolstered by their innovative design and propulsion lugs in the forefoot of their trainers. While the company has been on shaky ground lately with a series of financial setbacks, including the closure of all but 100 of their standalone stores, they are still producing original, dynamic trainers that runners of all calibers will appreciate. The Newton Kismet 3 is a testament to how lines of shoes find small but pivotal improvements with each edition. While the original Newton Kismet was received well upon its release, there were some complaints regarding its lack of durability and too-short laces. The Kismet 3 saw an improvement in its forefront design, but some complained that their feet hurt in that area after wearing them. In addition, some runners criticized that they were smaller than their advertised size. With the Kismet 3, Newton may have finally hammered out all of these small (but important) problems, designing a lightweight trainer that’s both comfortable and stable. Having added extra cushioning in the forefoot and heel that facilitates responsiveness and extends the Kismet 3’s durability and beveled lugs on the outsole–part of Newton’s Action/Reaction technology–that allow a smooth ride, the Kismet 3 is a stability core trainer that performs on all-day runs but can also be used for a run around the block. A great trainer for those looking for a stability shoe with excellent support, comfort, and responsiveness, the Kismet 3’s signature Newton outsole design may seem unfamiliar at first, but runners will be able to tell the difference in the smoothness of their ride. Looking to boost a runner’s speed, carry them along for many miles, and help overall performance in a race or on the road, the Newton Kismet 3 is a shoe that runners in the market for a stability shoe should take notice. We have spent 3.00 hours analyzing a total of 590 reviews. I love these and I appreciate the action & reaction shoe tech built into these while I run, I class these as dynamic running shoes designed to be different in a positive way, cushion is fine, stability is good, the shoe does grip most surfaces, ventilation does let me keep my feet cool, very good alternative to the big brand shoes. Totally sold on the outsoles unique build and the extra boost I get from these, running is easier and feels natural, like the grip-tractions from these and certainly quality for giving supportive stability, nice shoes. Actually, the support in these is an improvement. I get a good stable ride from these, very good transition between distances and speed needed, the upper is supportive, does not rub and the midsole feel supportive which in my case prevents aches and pains. Love the low-drop and the absence of shock or jarring that I have had with others shoes, the shoe gives nice stable support, I find it has a good traction, I’m an overpronator so I really do like the stable platform built underfoot, the shoe ,meets my demanding expectations easily. All possible stars for these. I have a bit of a history with foot pains and the midsole in these has pretty much fixed that for me, nice smooth uppers on these feel comfortable, no rubbing or tightness, 100% a good shoe. My stride is more about inner foot and these give maximum support where I most need it, I have been with these for a few years now and generally I get around 9 months wear out of each pair, nice shoe, tons up appropriate shoe tech. I love these because they work for me during long runs in that they counter the problems I used to get with ankle aches and knee pains, the shoe is incredibly supportive, these are a dream and run like a dream. I was starting to develop signs of runners knee and really did not want this to get worse, I swapped over to these and the problem has been stopped, this is a sure sign that these shoes are well designed, smartly built and give the right balance of support. Got these as the 4mm drop is what I was looking for and I’m not disappointed at all, some issues with sizing at first but changed to get an exact fit, lovely support from these and the shoe is a good performer. Like how these look and really like how they feel, I have had ankle support problems and issues with shock travelling through my feet but so far these seems to be giving me porotection from these issues, played around a lot to get the right size but really worth the efforts, no hesitation in saying these are a 4.5 star shoe. The toebox is tight and very uncomfortable, tried to break in these but no luck, I gave them to my friend, he uses them for walking in the countryside. What a waste of a running shoe. Tried re-sizing twice and that was enough, the sizing for these is too far of the mark. Sizing drove me crazy, size up etc and the shoe feels too big, choose my usual size and it’s much too tight, especially in the toebox which rubs enough to give blisters. I’m done with these, I want shoes I can put on straight from the box, these don’t work out at all. Tried sizing up by a half, no good, tried a full size up and it felt like wearing a canoe on each foot, I just don’t have time for these. Whatever happened to sizing as per the standard fits? Felt like screaming, the first pair just not true to size, sized up and the toebox is tight to the point it is painful, the shoe has a nice design and good shoe tech, you would think the sizing could be accurate. Of the 590 reviews we found in total, 19% were negative, and 81% were positive. A signature of Newton’s brand is their Action/Reaction technology, much of which is found in their unique outsole configuration. The Kismet 3 features this tech, which can be seen in the beveled lugs (which are tapered to provide a smoother ride) in the forefoot of the outsole. Working as a responsive cushioning system, these lugs provide quicker bounce-back with each strike, resulting in less lost energy than with traditional running shoe outsole configurations. Made of durable Sharc rubber compound, the traction found on the outsole is noticeable, and runners will feel the difference once they hit the road in the Kismet 3. One reason Newton is so distinct compared to other running shoes is the large amount of proprietary technology they use. Case in point is the midsole of the Kismet 3: outfitted with Newton’s P.O.P. 2 (Point of Power 2) technology, which delivers a bounce back with each step, the Kismet 3’s midsole is built with comfort and performance in mind. A thin slice of EVA foam adds to this cushioning, and the Action/Reaction technology, in which the midsole works in conjunction with the outsole’s lugs during compression and flexing, absorbs the shock of each impact, providing a great amount of energy release with each step. A metatarsal plate in the forefoot also aids in overall control and further protects the foot. The Kismet 3’s upper is made of open mesh that provides an excellent amount of ventilation to keep the foot cool and dry throughout a run. With overlays that criss-cross the upper to give it structure and allow for maximum breathability, the Kismet 3’s upper is light while also protecting the runner’s foot. Its traditional lace-up closure secures the foot for a snug but comfortable fit. Loaded with tech but sleek, this lightweight trainer weighs in at 10.1 ounces/286 grams, which may be a little heavier than some runners would like for a stability shoe that’s meant to perform on long runs. And this is even a little heavy when compared to other Newton brands, which are known for their ultra-minimalist design. But it’s still a lightweight running shoe--it’s just slightly heavier than comparable trainers on the market. As every runner knows, a shoe that lacks ventilation can affect performance and all-around enjoyment of the pursuit of running. Thanks to the Kismet 3’s upper mesh, runners won’t have to worry about this: its open mesh weave allows for air to enter the foot chamber without restriction, which will keep the foot cool and dry on a run. Learning from its mistakes from the Newton Kismet and the Kismet 2, which were somewhat uncomfortable and slightly tight, respectively, the Kismet 3 made comfort one of its priorities in the redesign. Utilizing Newton’s P.O.P. 2 technology that adds a bit of spring to each step, its thin EVA midsole provides a great amount of comfort without adding bulk to the shoe. The Action/Reaction technology in the shoe also helps release energy with each step, working with the lugs on the bottom to absorb each footfall’s impact. In addition, a metatarsal plate in the forefoot provides comfort and support. Thanks to its relatively low drop, the Kismet 3 is also a stability shoe, which will help for those with overpronation. One thing Newton Running does well is designing a shoe that is unmistakably Newtons. Brightly colored for high 360° visibility in low-light conditions. Similar in some ways to Asics in looks, with contrasting overlays on the upper that integrates subtle “N” trademark, the Kismet 3 is a difficult shoe to miss. However, some of the most distinctive stylistic elements are on the outsole, where few people would ever see. Which is a shame, since their outsole is where Newton’s craftsmanship really shines, particularly the lined lugs that match up with your toes. Not that anyone will miss these shoes anyway: bright, light, and out of sight, the Newton Kismet 3 is as kinetic in design as the heavy activity it hopes to inspire and facilitate. Newton builds running shoes to last, which is an important factor for serious runners that will be putting a lot of wear on their trainers. Following this, the Kismet 3 is solidly constructed of durable materials. Its Sharc rubber outsole is made of high abrasion rubber that’s resistant to wear and the heavy impact that retains its traction long into the Kismet 3’s active life. Its EVA midsole is also highly durable and will retain its springiness and cushioning even after heavy use and remain responsive. With a synth mesh comprising the upper, overall the Kismet 3 is a shoe that runners can depend on even after many miles have passed since first step-in. The Kismet 3’s sturdy Sharc rubber outsole is both resistant to wear and very durable. Covered with tenacious lugs, it will protect your underfoot from potential hazards found on most outdoor running surfaces. However, this is a trainer with a thin upper mesh and as such will not provide much in the way of protection to harsher elements; don’t go running through the snow or rain in these shoes. But for your daily running regimen in fair conditions, the Kismet 3 will provide the protection you need. Thanks to its thin EVA midsole and the Action/Reaction technology--in which the energy from the lugs being compressed during impact and then released through the midsole for great energy return--runners will find the responsiveness of the Kismet 3 impressive. Providing a snug fit with the foot wrapped naturally in the foot chamber, runners will appreciate its natural feel on the foot as they transition through the gait cycle. The Kismet 3 is a stability shoe, which aims to correct overpronation. Its lower drop may necessitate some adjustment, but once this is achieved, those who require a stability shoe will appreciate the support it provides. In addition, it features neutral arch support and a metatarsal plate in the forefoot for additional support. Made for traditional running surfaces, runners will find the Kismet 3 boosts their performance on asphalt, pavement, and on the track. Its Action/Reaction technology and tenacious lugs on the outsole provide great energy return with each lift-off on these traditional running surfaces. However, it is not meant for the trail or more extreme conditions. There are many distinct things about Newton shoes, and price is one of them: some runners may experience some sticker shock when they price a pair of Kismet 3’s (or any other Newton shoe), but with the unique technology involved, excellent quality, and craftsmanship with each pair, a serious runner will find a pair of Newtons well worth the price. One look at the outsole of the Kismet 3 and runners can tell it has some serious traction. With uniquely shaped lugs that are placed and shaped just like a foot that is beveled to provide a smooth ride, runners will find a great boost in their performance thanks to the Kismet 3’s lugs. Like many of Newton’s shoes, the Kismet 3 is a highly flexible shoe. Its mesh upper and sturdy but flexible outsole provides the runner with a great amount of surface control, while its solid but thin midsole similarly provides support without ever feeling too stiff. The Kismet 3 is a stability shoe, which means its drop is lower by more than half from regular trainers. Those who suffer from overpronation while running will be relieved by the Kismet 3’s smart support and construction. The Kismet 3 boasts of a drop of just 4.5mm, which is lower by more than half from the standard 10mm drop of most trainers. This is to help with stability and aid in correcting overpronation in one’s running style. Some runners unaccustomed to this lower drop may want to transition over a few weeks to this shoe, which is neither minimalist nor zero-drop. 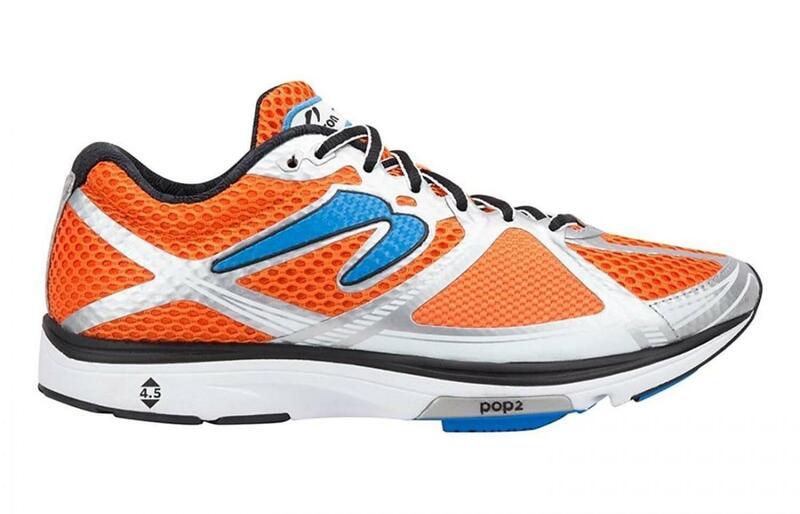 The Newton Kismet 3 is a high-end stability for serious runners that suffer from overpronation. While its price may be a little high, those who know their brands will recognize the Newton brand as one of the best smaller shoe companies on the market today. With Newton’s trademark Action/Reaction technology, serious traction thanks to its tenacious beveled lugs, and boosting one’s performance when on a run, the Newton Kismet 3 is a serious contender for one of the best stability shoes on the market. And it’s an improvement on the first two editions: with extra cushioning in the forefoot and heel for better responsiveness, a smooth ride thanks to the beveled lugs on the outsole, and an overall better fit that got rid of the tightness some of complained about from its earlier editions, it shows that Newton learns something new with each edition of a line.